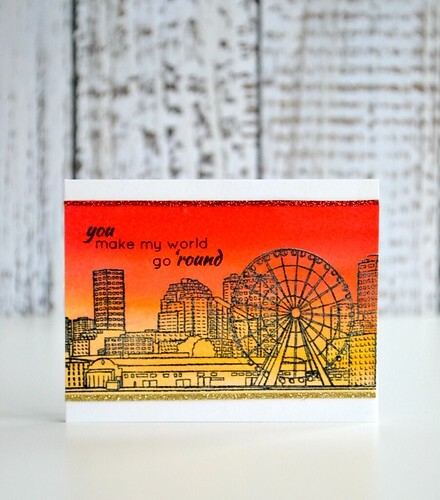 The sunset background was created by heat-embossing the cityscape onto watercolour paper then scribbling red, orange and yellow markers on top and blending them with a wet paintbrush. Easy peasy! I simply added a stamped sentiment and strips of corresponding glitter tape across the top and bottom of the scene then secured it onto a card front. Well that's all from me today, so it's time to hop along. Next on your hopping adventure is the talented, Anna Kossakovskaya! 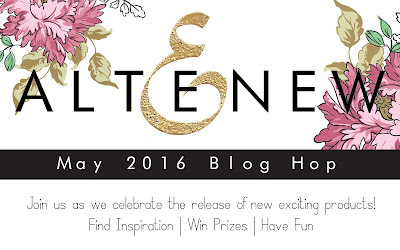 Altenew May 2016 release blog hop winner! 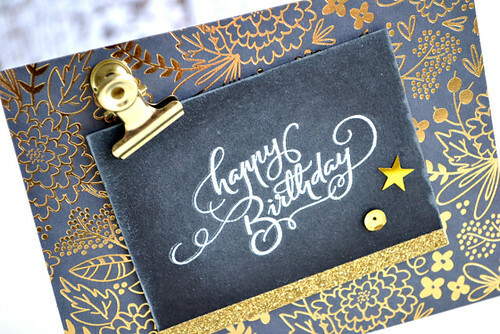 Love how sophisticated & trendy your cards are. I also love how with some minor tweaks both can be made appropriately masculine. Congratulations, Angelique! You've just won yourself a $30 Altenew gift certificate! Please email winner@altenew.com with the subject line 'May Release Blog Hop Winner from Amy's Blog' to claim it. Happy shopping! 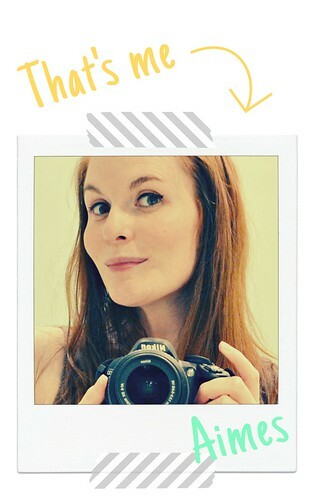 Thanks to everyone who joined in the fun of the blog hop last week! Fear not if you're not a winner here, as even more winners from the blog hop will be announced on the Altenew blog tomorrow and I'll also be over there sharing some more projects from this month's amazing release. I hope you can join me! Altenew May 2016 Blog Hop! Wa-hooooo for Friday! 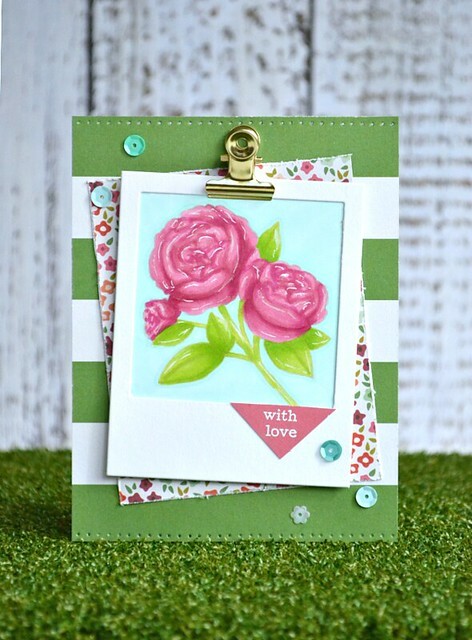 I'm here today as part of the wonderful Altenew May 2016 blog hop to celebrate the new release of an amazing 16 stamp sets and 10 die sets! You should have arrived here from the talented, Aga. 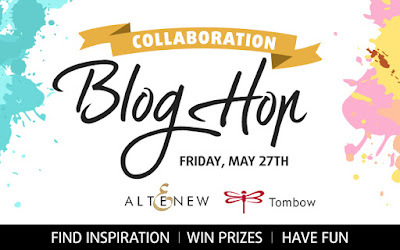 If you haven't then be sure to start out on the blog hop at Altenew HQ! 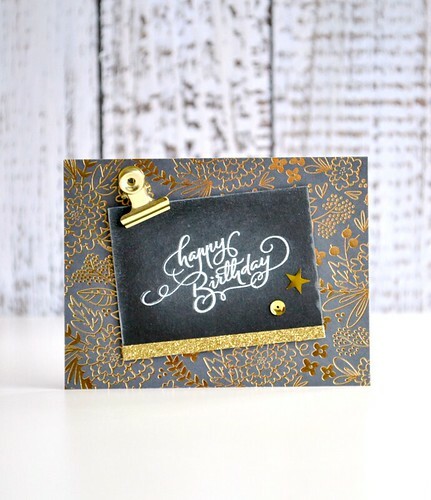 I'm a huge fan of the layered stamp sets and the brush style of this set will have you stamping on-trend watercolour-style projects with ease! I originally sat down to play with the stunning rose from this set, but I sat playing with the leaves and before I knew it, I'd created a background. I adore the mix-and-match elements of the Say Cheese stamp set. 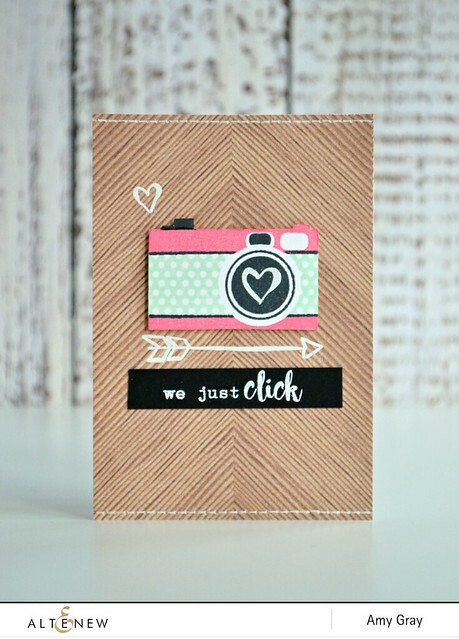 The hardest part about this card was choosing which style camera to stamp! I couldn't resist those polka dots. I then heat-embossed an arrow and hearts as trendy accents to the design. I love the sketchy nature of them from the From the Desk of stamp set. Right, there's some serious blog hopping to be done today and prizes along the way. To celebrate the release Altenew is giving away a $50 gift certificate to THREE lucky winners! Leave a comment on the Altenew blog by Thursday May 19th 11:59pm EST for a chance to win. Winners will be announced on Friday May 20th. That's all from me today, thanks so much for stopping by! Next on your hopping adventure is Anna Kossakovskaya. Happy hopping! I'm back today with one final project to celebrate the release and I couldn't resist inking up this stylish sentiment from the 'To You With Love' stamp set. You'll see that I've already inked up the stunning flower from this set on this card, so now it's time to let the sentiment of the set steal the spotlight! As this sentiment is the main focal point, I kept the rest of the design pretty simple (no surprises there!) 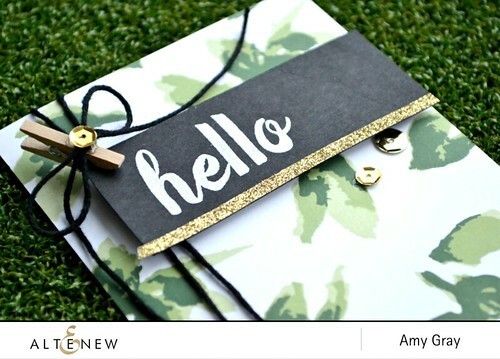 and added some touches of gold in the form of gold glitter Washi tape, a mini peg covered with the same Washi tape and some gorgeous gold foiled paper from the My Mind's Eye On Trend 2 paper pad. Black and gold: a classic, sophisticated colour combo I don't' think I'll ever tire of! Thanks so much for joining me this week for the sneak peeks of the new release. If you're busy shopping at Clearly Besotted tonight, I hope you manage to tick everything off your list! The sentiment is from the 'Mr & Mrs Hoot' stamp set and I've added detail to the die-cut heart by stamping the flowers from the 'To You With Love' stamp set (seriously, I can't get enough of that set!) and some hearts from the 'Just The Two Of Us' stamp set using a tone-on-tone ink. 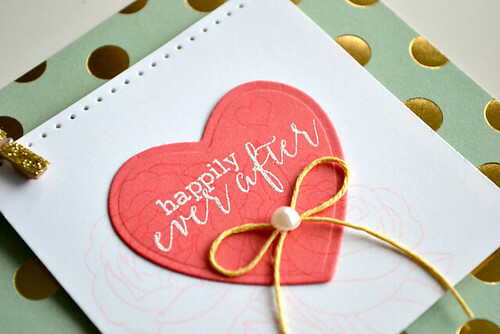 I then stamped those beautiful flowers onto a square of white cardstock and aligned the flowers on the heart with them to add a little more interest to the design. Well that's enough pondering and babbling from me today. If you haven't already seen the plethora of sneak peeks Stephanie has in store for you today, then be sure to visit! As always, she's sharing links to the rest of the Design Team featuring even more sneak peeks. I'll be back tomorrow to celebrate release day with one more card. I hope you can join me! 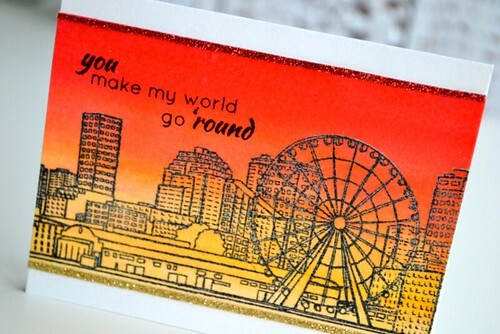 Today's card gives you a sneak peek of the beautiful, 'To You With Love' stamp set. I gravitated towards this set as soon as I laid my eyes up on it! 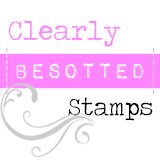 I always say that Clearly Besotted do the most fabulous floral stamp sets and this is set is of no exception! I'd normally go ahead and heat-emboss this image and colour it in, but I fancied doing something a little different so opted for the no-line colouring technique. I'm no artist (just check out Keren's or Debby's take on this flower to see how a real artist does this set justice) but I had fun stamping the image in Desert Sand Memento ink and colouring it with all of my three pink and three green Copics (I really want more!) I added a few highlights with a white gel pen and paired the image with some yummy papers from the My Mind's Eye On Trend 2 paper pad. This month we have the fabulous Taheerah Atchia, Anita Bowden, Vanessa Amann and Yoonsun Hur joining us as guesties! I'm also absolutely thrilled that we have my talented friend, Keren Baker, joining our Design Team! 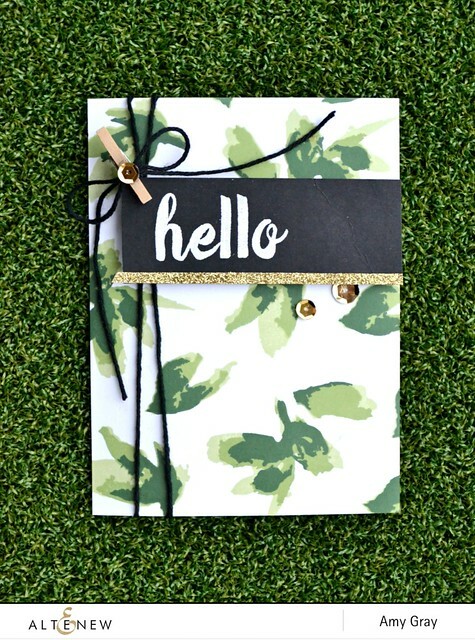 Pop across to their blogs to get your mojo fix – and while you're at it, hop across to Stephanie's for more sneak peeks and links to the rest of the Design Team sharing more jaw-dropping creations!